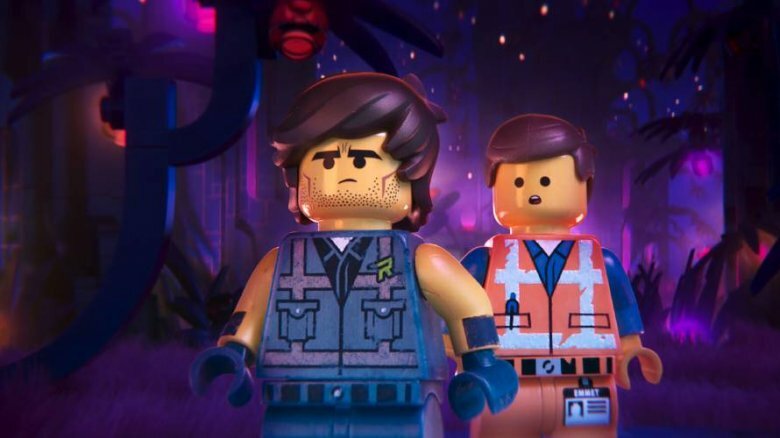 Five years and two spinoffs after the first film, The LEGO Movie 2: The Second Part arrived in theaters — and just like its predecessor, it's a film absolutely packed with details. 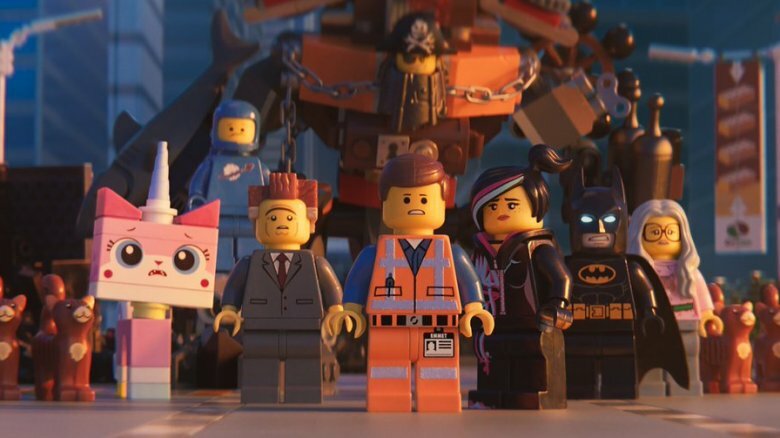 As with the first LEGO Movie, the sequel's story is set in a world populated by LEGO characters, buildings, and vehicles taken from various playsets, putting viewers in a constant mix of custom creations, familiar faces, and landscapes. That means that every scene might feature a notable cameo, every plot device could be borrowed from another piece of pop culture, and every team-up has the potential to be something you might never see anywhere else. It's a lot to take in, and even if you're really watching the film, you might get so swept up in the story that you'll miss a few of the more notable minor moments. But don't worry — we're here to help. 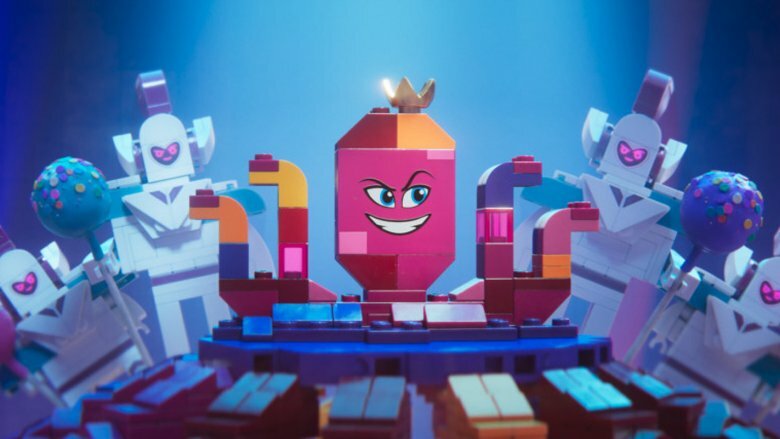 Now that you've seen the film, here's a look at all the details you might have missed in The LEGO Movie 2: The Second Part. SPOILERS AHEAD for the whole film. 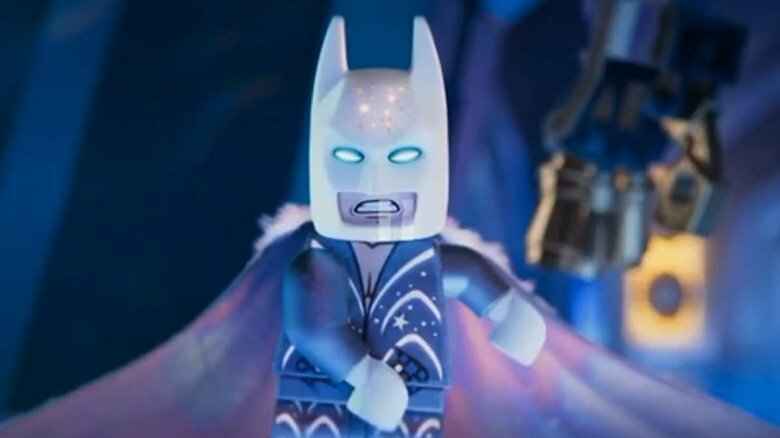 Though Batman (Will Arnett) is one of the stars of the LEGO Movie universe, he's far from the only superhero in the film. Other DC Comics icons are also around, and in The Second Part we're told that the rest of the Justice League once went on a mission attempting to stop the alien invaders from reaching Apocalypseburg once and for all. It didn't work; the next time we see the League, Superman, Aquaman, Wonder Woman, and the rest of the gang are covered in glitter and living happily in the Systar system. This, along with their journey, creates plenty of opportunities for little inside jokes, including the mention of Aquaman getting a new look because he's doing his own "standalone" thing, Green Lantern begging to be included in the adventures (he wasn't in the Justice League movie) and Wonder Woman getting her Invisible Jet hijacked in the middle of the film's climax, which is especially frustrating because she "left her lasso in there." The film spends much of its opening act establishing how things have changed since the first film, most notably the establishment of the post-apocalyptic landscape of "Apocalypseburg." The filmmakers hold nothing back during these moments, indulging in every possible disaster and post-apocalyptic movie cliche. When the Duplo aliens invade, we see buildings crashing into other buildings like the biggest disaster films. By the time the landscape is transformed, Lucy (Elizabeth Banks) is hanging out on a collapsed Statue of Liberty just like Planet of the Apes, Batman has his own Mad Max-style fortress, and everyone else is chanting about how much they love "custom vehicles!" To make this all even more satisfying, we learn that the landscape has become this way not just because a little sister has entered the picture, but because Finn (Jadon Sand), the boy from the first film, has grown into a teenager and has new uses for his blocks. In his imagination now, everything is darker and, as Lucy puts it, "grittier," and that means he's changed his own narrative interests to suit the idea that his sister is invading and changing the world. That's why all of his characters are so into brooding and custom vehicles. When General Mayhem (Stephanie Beatriz) shows up in Apocalypseburg and abducts its leaders — including Lucy and Batman — Emmett attempts to mount some kind of counterattack, and realizes he and the remaining citizens are looking at a rather dire situation. The Justice League is long gone, and all they're left with are characters like "generic Aquaman." Why? Well, because as one character helpfully points out, "Marvel's not returning our calls." 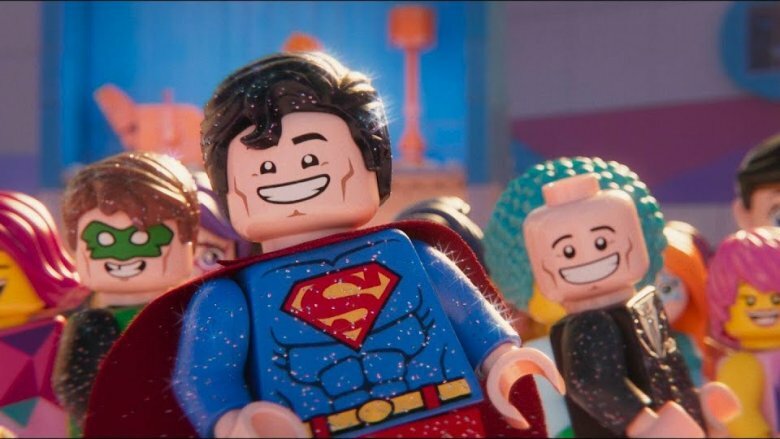 The LEGO Movie 2 is a Warner Bros. release, the same studio which owns the rights to DC Entertainment's many comic book heroes. 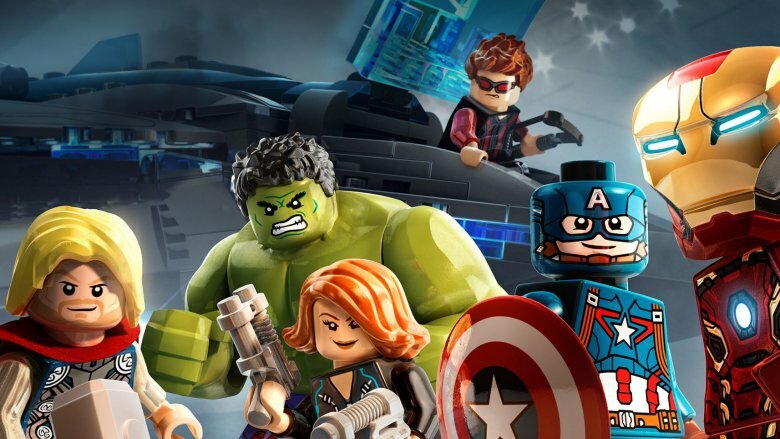 That explains Batman's starring role and the presence of the Justice League, but when it comes to Marvel, they're set up at a rival studio, even though Marvel heroes do exist in LEGO playsets and video games. It's a wonderful little meta joke, though of course we can't help but wonder just how the Avengers might have fared against all that glitter in the end. They might not have done any better than Superman and Green Lantern. Because Batman is one of the key players in the film, he gets even more meta-textual jokes than his Justice League counterparts, and he makes many of them himself. Batman of course spends plenty of time brooding about his place in Apocalypseburg, and then by the time Queen Whatevra Wa-Nabi (Tiffany Haddish) proposes marriage to him, he can't help but talk about how the Caped Crusader can never be tied down because it goes against what's appealing about him as a character. Then, of course, there's the readout that declares his "mask covers a metaphorical mask," and Whatevra's hard-to-get song about how she doesn't really like him, which touches on everything from his "George Clooney charm and Val Kilmer lips" to her declaration that she never liked him "even when you were Christian Bale." If you were wondering if the sequel could possibly fit in more little Batman jokes than the original LEGO Movie, the answer is yes. 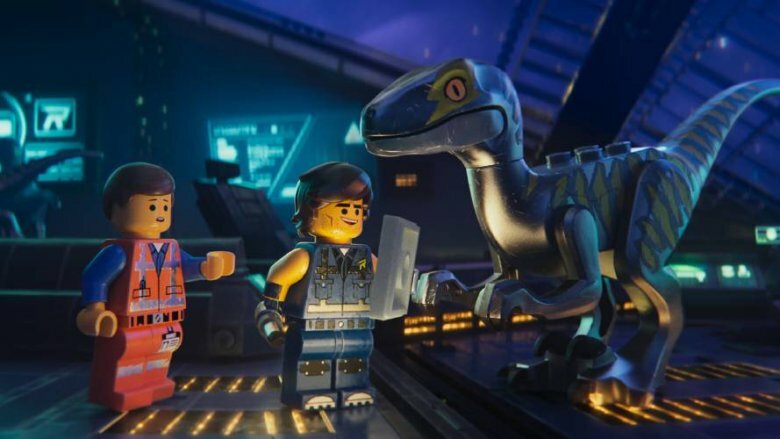 Everything changes for Emmet when — midway through his journey to the Systar System — he meets Rex Dangervest (also Chris Pratt), an impossibly cool action hero who seems to have come out of nowhere to help him save the day. 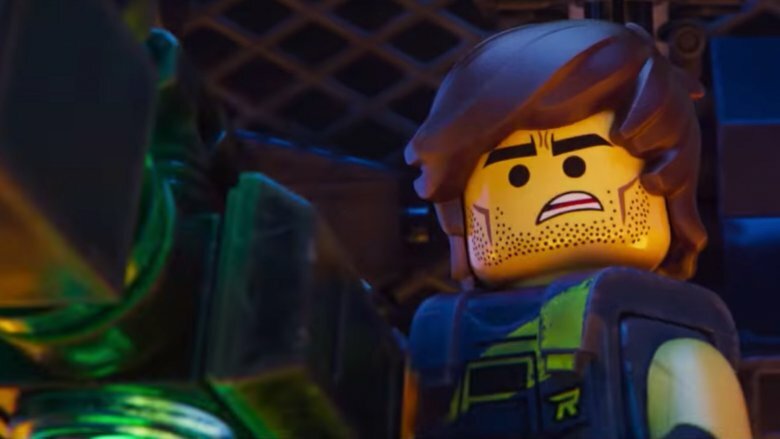 Over the course of the film we learn much more about Rex and why he's here: He's actually Emmet from the future, who's gone back in time to fix everything by breaking it, because he's bitter about how things turned out. That's why he's so extraordinarily gifted and seems to know exactly what's needed at exactly the right time, and in the course of letting us know this, the filmmakers throw in several amusing details. For one thing, Rex always seems to have the right gadget to solve the problem at hand, and they usually have very conspicuous names. At one point he pulls out a "CPD (Convenient Plot Device)" and at an another he uses his "Implausitron." Late in the film, while listing off his many talents and job titles, Rex throws out the term "Script Doctor," which is literally a person called in to rewrite a screenplay. Rex is rewriting his own existence with convenient plot devices, and these little hints put that twist right in front of us the whole time. Rex seems to be specifically engineered to be the coolest person Emmet has ever met. His ship looks likes a closed fist when it flies, he has a cool name, and he even has cool stubble. The stubble and the defined cheekbones are referred to as "chiseled features previously hidden under baby fat," Rex's ship plays rock hits when he flies it, and he hangs out with a bunch of velociraptors that he's personally trained. All of this points to one very clear joke: He's supposed to be Chris Pratt later in his career. That gag later gives way to a number of smaller jokes, specifically when it comes to the raptors. At one point Rex starts saying their names, and we learn that they're called things like Cobra, Ripley, and Connor, as in Marion "Cobra" Cobretti, Ellen Ripley, and Sarah Connor. Rex has named his raptors after '80s action heroes, making himself seem even cooler. While Emmet is meeting up with Rex, Lucy and the gang meet Queen Whatevra Wa-Nabi at her palace in the Systar System, and that's when they're introduced to her "spa," which to Lucy just seems like a massive effort to cover them all in glitter and brainwash them. Upon entering the spa, they're greeted by Balthazar (Noel Fielding), an "attractive and non-threatening teen vampire" who's covered in blue glitter and acts as the queen's DJ. When Lucy tries to tell everyone they're in a facility that's going to brainwash them, Balthazar corrects her by referring to the place as a "self re-education celebrity center." This is never brought up again, and it's only a brief remark, but this would seem to be a joke aimed in the direction of the Church of Scientology, which runs various "celebrity centres" around the world for prominent people to come in, learn about Scientology, and supposedly lead better lives through its principles. It's one of the film's most clever and most subtle digs. 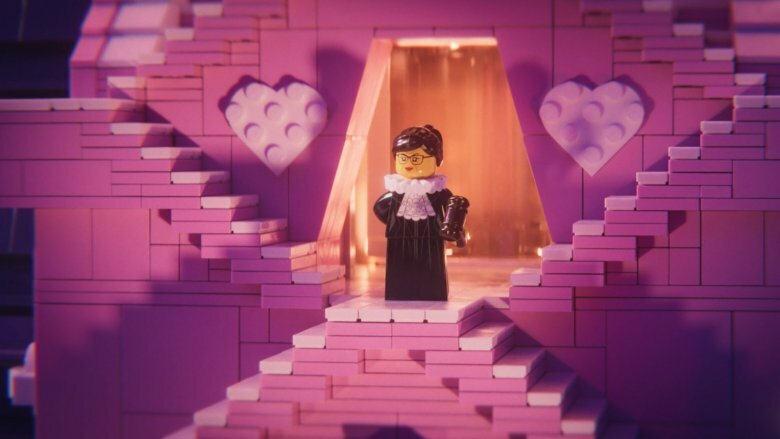 The LEGO Movie 2 is packed with references, cameo appearances, and asides, but the filmmakers are clearly more interested in some of these jokes than others because a few of them come back again and again. One of the best and most unexpected of these recurring bits arrives in the Systar System, when Lucy notices Bruce Willis (voiced by the real Bruce Willis) sitting in a hot tub. 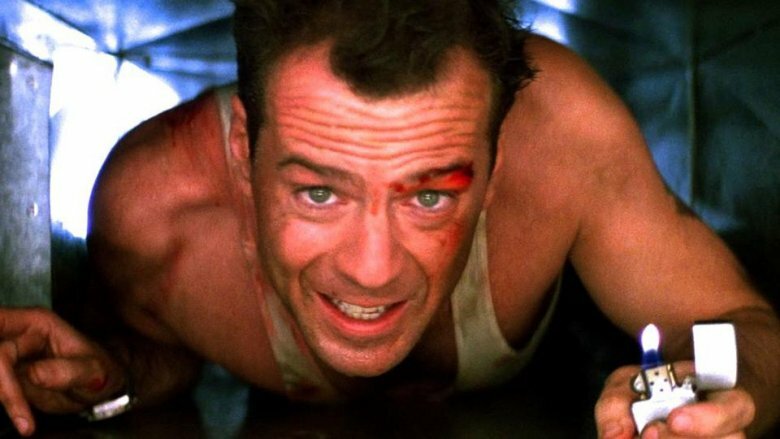 Later, while attempting to escape the song that's gonna get stuck inside your head, Lucy finds Willis again, this time crawling through an air vent a la Die Hard ("I don't live here or anything," he says). Still later, when Emmet and Rex are making their way through a similarly tight spot, they too find Bruce Willis. The joke never goes any further than the presence of Bruce Willis in LEGO form and his apparent inability to move past Die Hard, which if you dig deeper would imply that Finn saw Die Hard once and loved it enough to get a Bruce Willis figure. Willis is clearly playing a caricature of his '80s action hero self in the film, but he's far from the only real person to make an appearance. Other characters based on people from history and still-living celebrities are peppered in throughout the film. We see Cleopatra roaming around Apocalypseburg early on, and President Abraham Lincoln hanging out on what would appear to be a robotic throne. During Batman and Whatevra's wedding, it's revealed that her wedding party includes Marie Curie and Ruth Bader Ginsburg, and at one point — for no reason other than it seems to be fun — former NBA star Gary Payton and former WNBA star Sheryl Swoopes show up for a brief cameo, talking to each other about the strangeness of their situation. None of these characters have major roles to play, but they serve to remind us just how vast the LEGO world is, they throw out a couple of in-jokes (Lincoln quips about having theater tickets as he falls into a chasm), and they make you wonder what other cameos await as the franchise heads into its next installments. Near the end of the film, Rex reveals who he really is — Emmet from the future — and tells his whole story. He got stuck under the dryer, and finally propelled himself out with his own anger, but he needed a way to get back to the past and fix things, so he set about constructing a time machine for himself, and along the way he had to borrow parts from pretty much every other famous time machine. In one clever montage, we get cameo appearances from the DeLorean from Back to the Future, the phone booth from Bill and Ted's Excellent Adventure, The TARDIS from Doctor Who, the time machine from The Time Machine, and even the hot tub from Hot Tub Time Machine. It goes by very fast, and we only ever see one artifact from these machines again — the DeLorean's flux capacitor, naturally — but it's enough to remind us just how freely the film pulls from various pop culture staples to make its own fun. You know, just like a kid with a bunch of LEGO sets. As the film is winding down, and in the human world brother and sister have learned how to play together, the camera still makes time for one more brief cameo appearance. As it pans past the basement stairs where the massive LEGO playset used to be, we see a life-sized LEGO recreation of an Academy Award sitting on the stairs. 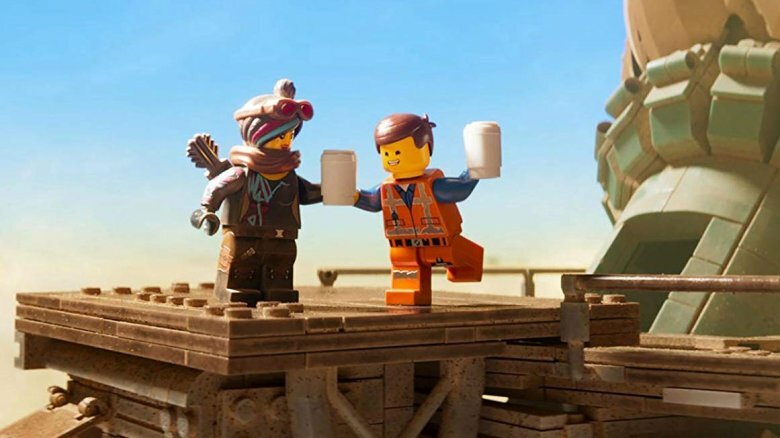 The LEGO Movie, ironically, was not nominated for Best Animated Feature at the 2015 Oscars, though it did ultimately win the BAFTA Award in the same category. 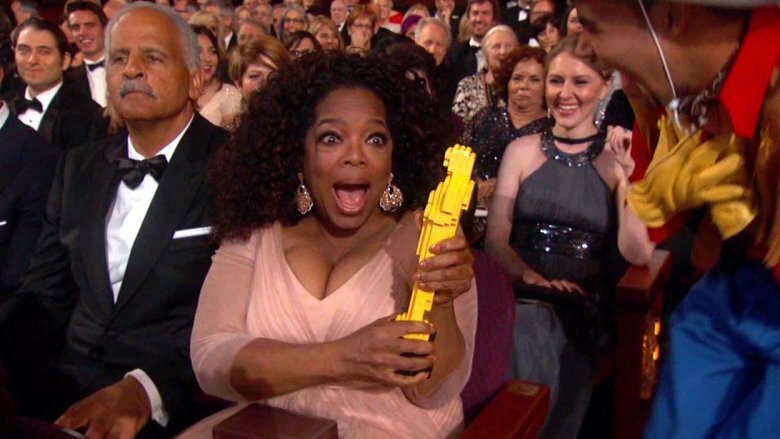 It was, however, nominated for Best Original Song for "Everything Is Awesome," and while that song was performed live by Tegan and Sara and the Lonely Island at the ceremony, dancers went into the audience and passed out life-sized LEGO Oscars to various celebrities, including Oprah Winfrey, who reacted very appropriately. It's a nice little nod to that moment, and perhaps a little hint that the sequel would also like some Oscar love, please.